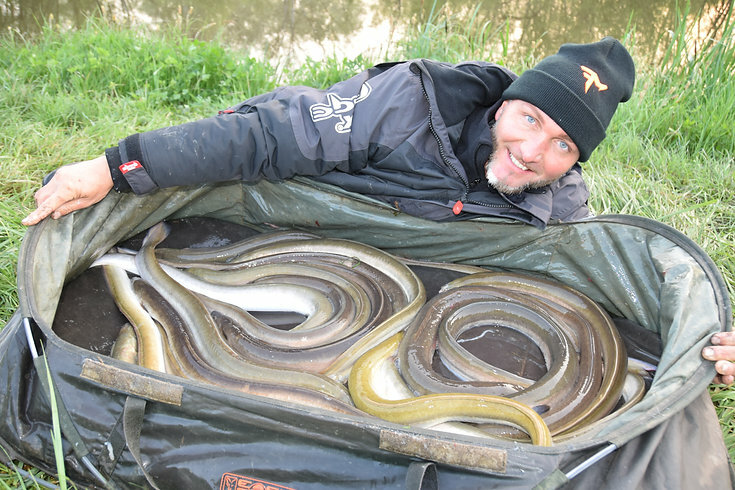 I’d been planning to go eel fishing on Lake Balaton for years when I met Zsolt Bakonyi at the fishing show last autumn. Zsolt drew my attention to the canals flowing into the lake. In the spring when the temperature of Lake Balaton reaches 8 Celsius, the eels gather into groups and start their migration towards the Sargasso Sea. Anglers can exploit this period and catch a lot of them. Eels have not been stocked in Lake Balaton for more than 25 years. Today, it’s considered an invasive species. 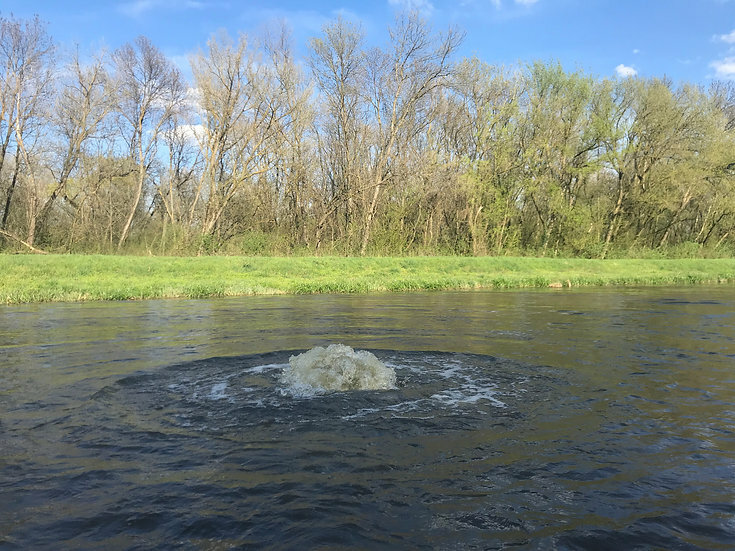 As it feeds on fish eggs and spawns it can cause huge damage to the sander and other fish populations. The eel is thought to be responsible for the depletion in the number of burbots too. Due to its culinary value, during the year many anglers fish for eels near the shore, but the main eel season is in the early spring. At this time of the year, huge crowds of eel anglers appear on the canals. Near the good pegs there are anglers sitting 5-10 m from each other. It’s almost like some kind of a festival. Anglers fishing here usually catch lots of eels. As the eel spawns only in the Sargasso Sea, the fish caught on the canals can’t reproduce. Therefore there are less and less of them. The European eel is on the verge of extinction. From the 1970s its population has decreased by 98%. The floodgates and power plants built on the canals and rivers prevent the migration of the species. Due to its valuable and tasty meat, it’s overfished. Also, the natural change of the Gulf Stream and environment pollution have decreased their population. 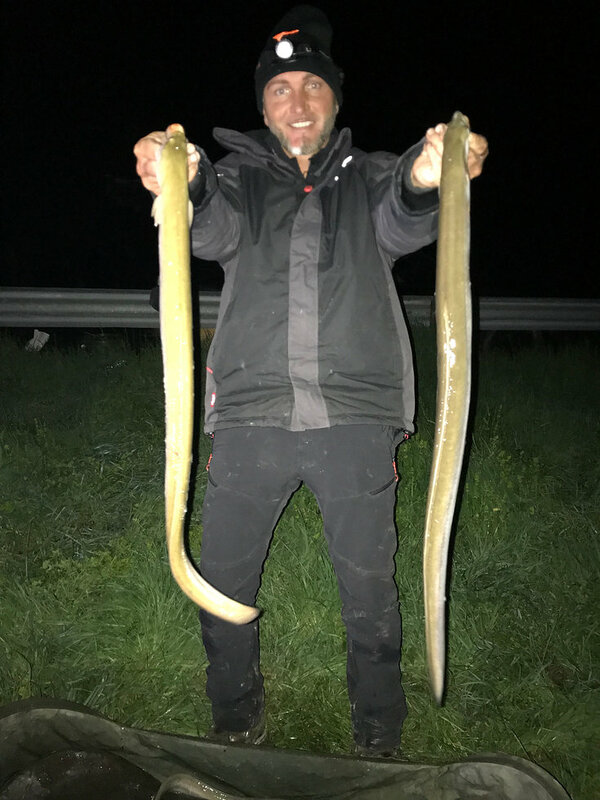 Although there are fewer eels, we can still fish for them as they can live up to 50 years in Lake Balaton and in the waters connected with the lake. Zsolt suggested trying Mária canal. To be more precise, the area around the effluent of the wastewater treatment plant in Kéthely. The area where the cleaned wastewater flows into the canal is one of the best eel swims and is frequented by many anglers. When I arrived, there were so many anglers that their shoulders literally touched each other. I’d spent no more than 2-3 hours among the anglers when I decided to move to another peg towards Balcsi 500 m down the bank. Too many people inevitably make noise. The noise of speech, the opening of buckets, the lights of headlamps, and closing the door of the car are all bad for catching fish. It’s true that the eel is quite aggressive and not too sensitive to these noises, but these are fish older than 25 years. They have experienced a lot of things. You would think that catching them is fairly easy, which is partly true, but still, there are a few tricks that can help you become more successful. I always try to find the best solution for every situation and species. I try to imagine logically what happens under the surface of the water. When does my target species feed and how? What are the natural food sources and where can they be found? Sometimes a well-thought rig or fishing and feeding the swim precisely brings success. I used a Manta Evo x Medium-Heavy feeder and a Daiwa Lexa W reel spooled with 0,25 mm Shimano Technium line. I’ve tried different methods for eel. First I used fishmeal based groundbait and worms, but the large number of bream spawning in the canal made fishing impossible. After a few casts, there were some many bream on my feed that the older eel, which might have sensed the danger, avoided my hooks. I had to stop using this method and come up with a traditional lead rig. First I made a river rig with a long hooklink and a sliding lead, but this didn’t seem to work. I felt that both the lead and the feeder was deep in the sludge, so I changed them to a rig with two hooks. I left one hook on a sliding 40 cm-long hooklink at the end of the line and I put the other 10 cm-long hooklink approximately 1 m above a tirole (a special lead for predator fishing). I positioned the tip of my rods high, so I could keep my upper hook floating 5-10 cm above the bottom no matter how far I cast. Naturally, I was experimenting with hookbaits too. The best were all kinds of worms particularly rainworm. After I’d figured out this method, we started filming the next episode of FEEDERMANIA. I tried to make to best of the session, so I’d chosen a night when there was a cold front. My plan worked. Thanks to the perfect rig, the hookbait, the weather conditions, and the calm peg I caught as many eels as never before. I cast my rigs before it got dark and shortly after I was on. Almost after every cast, I had a take. 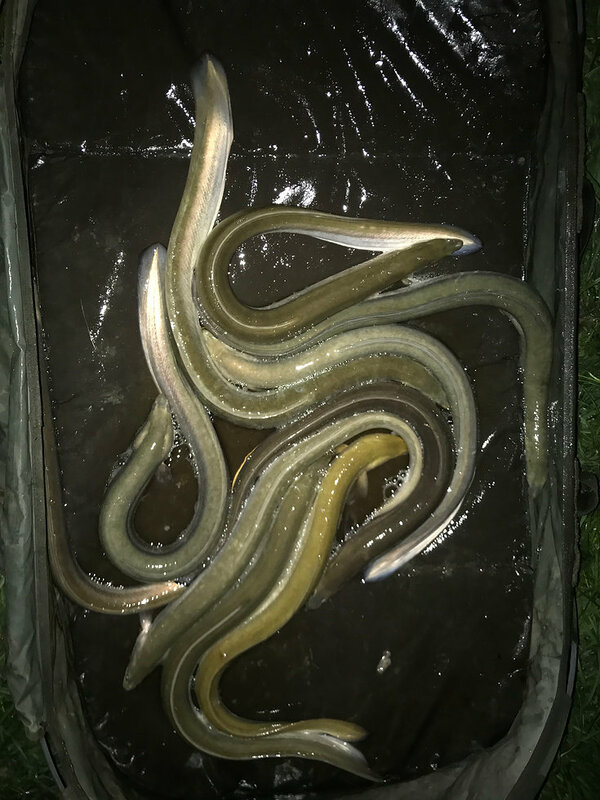 Mostly eels over 1 kg, but I also caught, besides bream, Volga zander, a wild carp over 5 kg, and the icing on the cake was a Wels around 12-15 kg. Night photo after a few hours of fishing. Surprise at night. 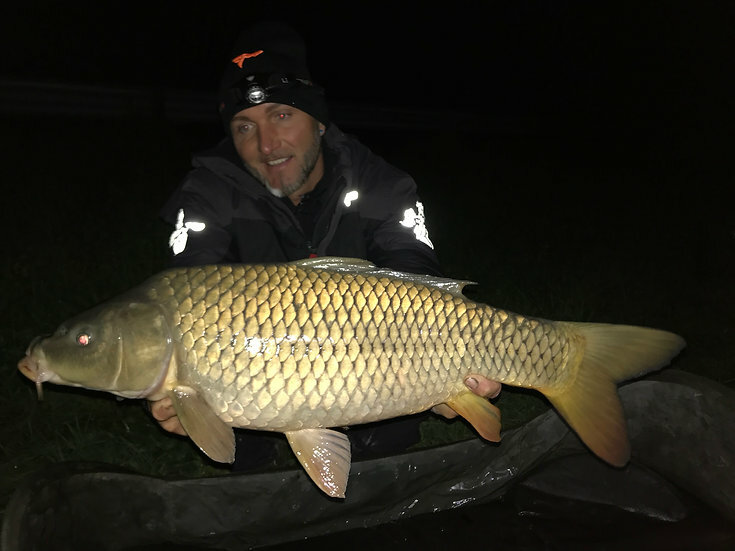 A wild carp around 1 kg. I caught mostly 90-110 cm eels. The icing on the cake was the Wels. 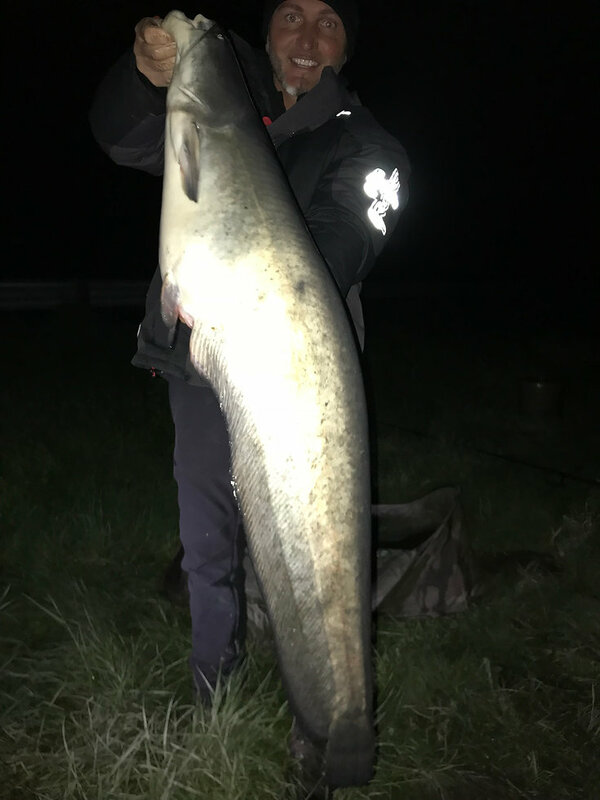 At night I decided to finish the session after the 20th eel. This happened at dawn. Interestingly, I caught only 2 fish out of 30 on the lower hook. After photo shooting and packing I was thinking that a good idea can really make a difference. Also, if you’re in the right place at the right time, you can gain fantastic experiences during a wild water session.